With her natural beauty and languid charm, the artist Serena Mitnik-Miller draws immediate comparisons to a classic surfer babe. Which makes sense, since she's spent most of her life near the ocean -- first, as a child raised by two working artists in Hawaii, and later, in her adult life, as a California-based painter and the owner of General Store, a shop where she sells artisan-produced goods with locations in both Ocean Beach (San Francisco) and Venice Beach (Los Angeles). But it's less the ocean and more the community of artists surrounding her that informs the many facets of Mitnik-Miller's life. 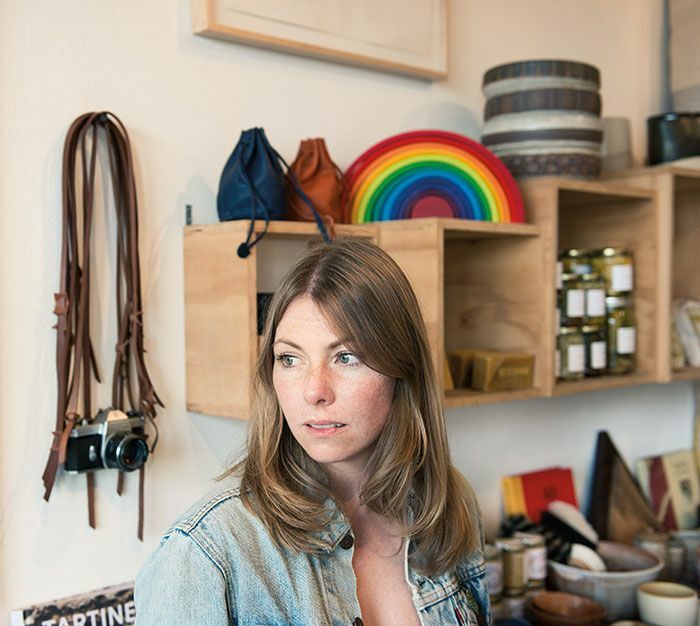 General Store, which she opened in 2010 with her husband, the designer Mason St. Peter, is the natural outgrowth of her relationships with fellow painters, sculptors and artisans, with whom she had established a habit of trading works. "I get really inspired when artists I admire want to exchange something with me," she explains. "I like thinking about my work in their homes." As a result, the store, featuring a carefully curated mixture of furniture, clothing, tools, plants, household items, books, jewelry, cards and small treasures, feels more like Mitnik-Miller's private space, where she lives with the artworks she trades, than a typical boutique. Dividing her time between painting and curating, the store has provided both inspiration and balance in Mitnik-Miller's life. In 2012 she opened the Venice Beach location with her friends from the POP Studio in L.A., and earlier this year her work -- ordered, meditative, geometric watercolors reminiscent of the washed-out planes of Agnes Martin -- was on display in New York at Joshua Liner Gallery. "I recognize that this is ideal," Mitnik-Miller says of her career. Here's to the California dream. General Store is located at 4035 Judah St. in San Francisco and 1801 Lincoln Blvd. in Los Angeles.